Troy Trevor Tulowitzki (born October 10, 1984), nicknamed "Tulo", is an American professional baseball shortstop for the Toronto Blue Jays of Major League Baseball (MLB). He previously played for the Colorado Rockies. After a standout college baseball career for California State University, Long Beach, the Rockies selected Tulowitzki with the seventh overall selection of the 2005 MLB Draft. He made his MLB debut the following year. Tulowitzki is a five-time MLB All-Star, a two-time Gold Glove Award winner, and a two-time Silver Slugger Award winner. Tulowitzki's arm, range and instincts at shortstop are highly regarded. Furthermore, his size, ability and leadership skills have garnered him comparisons to Cal Ripken, Jr., Alex Rodriguez and Derek Jeter. Tulowitzki graduated from Fremont High School in Sunnyvale, California. He earned four varsity letters in baseball and two in basketball. He was twice named second team All-State in baseball, and was a 3-time team Most Valuable Player. As a junior, Tulowitzki had a batting average of .536. He also went 15–1 on the mound. As a senior, he batted .519 with 6 home runs. In basketball, Tulowitzki won league MVP, and was second team All-State and team MVP, averaging 22.6 points per game during his senior year. He was named Fremont High Athlete of the Year in 2002. A sure-handed starting shortstop for three seasons at California State University, Long Beach, Tulowitzki had a .962 career fielding percentage. Offensively, in 155 career games, he had a batting average of .310, with 20 homers, 117 RBIs, 37 doubles, and a .491 slugging percentage. He also accumulated 31 multi-hit games in his collegiate career. Baseball America rated him as having the top arm and as the best defensive shortstop in the Big West Conference. Tulowitzki was a two-time All-Big West selection (second team in 2003 and first team in 2004) and a two-time All-Regional Tournament selection, earning Most Outstanding Player (MOP) honors in 2004. In 2004 he was selected for the United States collegiate national team and helped lead Team USA to a gold medal in the World University Baseball Championship. He was drafted by the Colorado Rockies, with the seventh overall pick in the first round of the 2005 Major League Baseball Draft. Tulowitzki made his Major League Baseball debut with the Rockies on August 30, 2006, against the New York Mets. He had four at-bats and went hitless with three strikeouts. Tulowitzki made it to the big leagues after playing just 126 minor league games. He collected his first Major League hit, an infield single off Óliver Pérez of the Mets, on August 31. Tulowitzki hit his first MLB home run on September 4, off Woody Williams of the San Diego Padres, in a 7–5 loss. He posted a .240 batting average with one home run and six RBIs in 25 games during the 2006 season. Tulowitzki entered spring training prior to the 2007 season in a battle with incumbent Rockies shortstop Clint Barmes for the starting role. After a spring that saw Tulowitzki win the spring training's MVP award, along with Barmes struggling offensively, Tulowitzki entered 2007 as the Rockies' starting shortstop. As a rookie, Tulowitzki established himself in the eyes of some as a Gold Glove-caliber shortstop. He led all MLB shortstops in fielding percentage (.987), putouts (262), total chances (834), assists (561), and double plays turned (114; 2 more than Jack Wilson, in 233 more innings). He also ranked first in range factor (5.39) and second in zone rating (.866). His target at first base, 3-time gold glover Todd Helton, led the National League in fielding percentage (.999; for the second straight year) and range factor (10.39). Tulowitzki's .987 fielding percentage set an MLB-single season record by a rookie shortstop. He was also a major contributor in the Rockies' MLB-record .98925 fielding percentage for one season. Tulowitzki ended up not winning the 2007 National League Gold Glove Award, which is voted on by NL coaches and players. The award went instead to Philadelphia Phillies shortstop Jimmy Rollins, despite the fact that Tulowitzki had a better fielding percentage (.987 to .985), zone rating, and range factor, and more total chances, putouts, and assists, and turned 4 more double plays, in 66.1 fewer innings, than Rollins. They each had 11 errors, but Tulowitzki's came on 834 total chances, compared to Rollins' 717. Tulowitzki did, however, win the Fielding Bible Award at shortstop, which is awarded to the shortstop who a panel of voters view as the best defensive shortstop in Major League Baseball. The panel consists of national sports writers, scouts and sports radio talk show hosts. On April 29, 2007, Tulowitzki turned just the 13th unassisted triple play in MLB history, during a 9–7 home victory at Coors Field over the Atlanta Braves. As of 2009, eight of the 15 unassisted triple plays have been made by a shortstop. In the top of the seventh, Tulowitzki caught third baseman Chipper Jones' line drive with the runners moving, then stepped on second base to retire Kelly Johnson and tagged Edgar Rentería – who made no attempt to escape – before he could return to first base. Confused and not realizing what he had done, Tulowitzki went back and tagged second again, then threw the ball to Helton at first, neither of which was necessary. Instead of giving the historic triple play ball back to Tulowitzki, Helton accidentally tossed it into the crowd. However, the ball was eventually retrieved and returned to Tulowitzki a couple of weeks later. Tulowitzki was named the NL Rookie of the Month for August. On September 10, 2007, Tulowitzki hit his 20th home run of the season, which set the record for most home runs in a single season by a National League rookie shortstop. The previous record was 19, held by Ernie Banks. Tulowitzki hit his first career grand slam on September 29, 2007, in an 11–1 home win over the Arizona Diamondbacks, off of Dustin Nippert. He ended with 24 home runs on the season. In the 2007 season, Tulowitzki ranked first among NL rookies in at bats (609), plate appearances (678), games (155), hits (177), doubles (33), runs (104), total bases (292), walks (57) and RBIs (99; 2 ahead of Ryan Braun, in 158 more at bats than Braun). Tulowitzki's 99 RBIs led all National League shortstops (he was 3 short of a tie for the MLB lead, held by Detroit Tigers shortstop Carlos Guillén). His RBI total set an MLB-single season record for a rookie shortstop. He finished second behind Braun in OBP (.359). He was third behind Braun and Hunter Pence in batting average (.291), slugging percentage (.479), OPS (.838) and triples (5). Tulowitzki was also third behind Braun and Chris Young in home runs (24) and extra base hits (62), and tied for ninth in stolen bases (7). Tulowitzki tied Young, Rajai Davis and Norris Hopper for the lead among all NL rookies in caught stealing (6), was second to Carlos Ruiz in grounding into double plays (14, which was one more – with 158 more at bats – than third place Braun) and second behind Young in strikeouts (130; leading all NL shortstops). However, Tulowitzki had the third lowest strikeout ratio (21.3%) out of all rookies with at least 400 at-bats, behind Kevin Kouzmanoff (19.4%) and Pence (20.8%). He batted .320 with a .554 slugging percentage and 15 home runs at mile-high Coors Field, but hit only .256 with a .393 slugging percentage and 9 home runs in away games. However, it should be noted that one of the reasons for any substantial differences in home and road splits for Rockies batters is that they have to make adjustments in how they see pitches away from Coors Field – particularly breaking balls, such as sliders and curve balls – since those pitches act differently at Coors Field than on the road. Team veterans alerted Tulowitzki every time Braun, his chief rival for rookie of the year honors, hit a home run. Tulowitzki had a 10.8 WARP3 for the season (WARP3 is a metric that measures offensive and defensive production). By comparison, Tulowitzki's rookie of the year rival, Braun, only had a 4.8 WARP3 rating. Tulowitzki came in second in the race for National League Rookie of the Year. The award was voted on by 32 members of the Baseball Writers' Association of America, two from each National League city. Braun beat Tulowitzki, 128 points to 126 points, which was the closest voting in the NL since the current system was adopted in 1980. Tulowitzki also lost to Braun in the vote for the 2007 NL Sporting News Rookie of the Year Award, which was voted on by 488 major league players and 30 managers. Furthermore, he lost out to Braun in the competition for the 2007 Baseball America Rookie of the Year Award, in the vote for the 2007 Players Choice NL Most Outstanding Rookie by their fellow major league players, and in the Baseball Prospectus 2007 Internet Baseball NL Rookie of the Year Award, with 487 first place votes, versus 666 for Braun. However, on December 14, fans voted Tulowitzki the This Year in Baseball Rookie of the Year, with 27.6% of the vote, which was ahead of Boston Red Sox second baseman Dustin Pedroia (26.3%) and Braun (22.3%). Tulowitzki was selected to the 2007 Topps Major League Rookie All-Star Team. The selection was the result of the 49th annual Topps balloting by Major League managers. On October 1, 2007, in a one-game tie-breaker against the San Diego Padres, Tulowitzki went 4–7 with 3 extra-base hits and scored the tying run in the bottom of the 13th inning. The Rockies won the game, 9–8, and entered the playoffs as the NL wild card team. They faced the Philadelphia Phillies in the National League Division Series. On October 4, 2007, in the second game of the series, Tulowitzki and left fielder Matt Holliday hit back-to-back first-pitch homers in the first inning to begin a 10–5 win, and the Rockies headed to Denver with a 2–0 lead in the series. The Rockies went on to complete a three-game sweep of the Phillies, and advanced to the National League Championship Series, in which they swept the Arizona Diamondbacks in four games. Colorado then played the Boston Red Sox in the World Series, which was the first ever World Series appearance in Rockies history. Boston swept Colorado in four games. Tulowitzki batted .195 in the postseason, with a .267 on-base percentage and 15 strikeouts in 41 at-bats. Fox Sports writer Chadd Finn stated that while the World Series was the first time that he thought Tulowitzki looked like a rookie all season, he feels Tulowitzki will be better for the experience. At the same time, MLB Hall of Fame shortstop and third baseman Cal Ripken, Jr. offered his own assessment of Tulowitzki: "He has a strong offensive game, but defensively, he's unbelievable. He really thinks about the position, all aspects of the game. I love that about him." On January 23, 2008, Tulowitzki signed a six-year, $31-million contract extension with the Rockies. The deal, which also included a club option for 2014, was the largest-ever contract for a player with less than two years experience until Ryan Braun signed an eight-year, $45-million contract extension with the Brewers on May 15, 2008. On April 29, 2008, in a 3–2 road win over the San Francisco Giants, Tulowitzki tore a left quadriceps tendon during a defensive play in the first inning. He wasn't originally in the starting lineup for the game; however, he was put in at the last minute after utility player Jeff Baker broke a blood vessel in his throwing hand during pregame warmups. On June 11, Tulowitzki played his first rehab game since the injury, as he started at shortstop in a minor league game for the Modesto Nuts – a high-A affiliate of the Colorado Rockies. 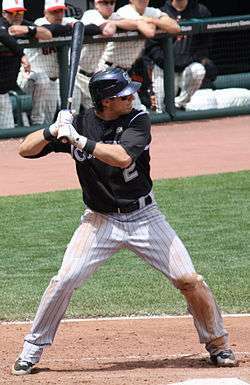 He returned to the Rockies, starting at shortstop, on June 20, in a 7–2 home loss against the New York Mets. Tulowitzki went hitless in four at-bats and committed no fielding errors in the game. Colorado optioned second baseman Doug Bernier (who made his MLB debut with the team on June 17) to Triple-A before the game in order to open a roster spot for Tulowitzki. On July 5, 2008, Tulowitzki went back on the disabled list after cutting his right palm in the previous day's 18–17 home win over the Florida Marlins. The injury occurred in the bottom of the seventh inning when Tulowitzki slammed a maple bat into the ground in frustration. The incident took place after he was taken out of the game in that same inning; however, he noted that the frustration leading up to his injury wasn't due to being taken out, saying, "I was a little bit frustrated, not at the move. If anything, I thought it was the right move. I came in the hallway, grabbed a bat, hit it on the ground and the bat exploded in my hand and cut open my palm running up to my index finger." The cut required 16 stitches, but no damage was done to any tendons or nerves. Tulowitzki returned to the Rockies lineup, starting at shortstop, on July 21, 2008, in a 16–10 home loss against the Los Angeles Dodgers. He recorded a career-high five hits during the game, as he went 5-for-5 with one RBI. Also since returning from July 21 he has had 6 multi-hit games in his past 8 games (updated through July 29). During the season in games prior to July 21, Tulowitzki only had six multi-hit games (38 games played, prior to July 21). Tulowitzki ended the 2008 season with a .263 batting average, 8 home runs, and 46 RBI in 101 games. Tulowitzki with the Rockies in 2010. On August 10, 2009, Tulowitzki hit for the cycle as part of an 11–5 home win over the Chicago Cubs. He also had a career-high seven RBI, which tied for the third-most RBI in MLB history in a game for a player who hit for the cycle. Tulowitzki became the fifth Rockies player to hit for the cycle. He also was the second player in MLB history to hit for the cycle and record an unassisted triple play in a career. Tulowitzki hit a career-high 32 home runs during the season and had a .552 slugging percentage, both of which led all MLB shortstops. He was second in RBI (92), triples (9), walks (73) and on-base plus slugging percentage (.930). He finished fifth in voting by the Baseball Writers' Association of America for National League MVP. On June 17, 2010, Tulowitzki fractured his wrist after being hit by a pitch from Minnesota Twins reliever Alex Burnett. He was placed on the disabled list the following day. On July 4, 2010, Tulowitzki was one of two Rockies, along with starting pitcher Ubaldo Jiménez, selected as a National League All-Star to play in the 2010 Major League Baseball All-Star Game at Angel Stadium of Anaheim. It was Tulowitzki's first All-Star appearance, but due to being on the disabled list since June 18 with a fractured wrist, he was replaced by New York Mets shortstop José Reyes. In September, Tulowitzki hit 14 home runs from September 3 through the 18th, garnering him back-to-back NL Player of the Week honors for September 6–12 and 13–19. He also earned his first National League Player of the Month award for his efforts during the month of September, in which he led all MLB players with 15 home runs, 40 RBI, 30 runs scored and an .800 slugging percentage. Only Babe Ruth had just as many or more home runs (17) and RBI (43) during that month in MLB history. Tulowitzki finished the 2010 season leading all MLB shortstops in home runs (27), RBI (95), batting average (.315), on-base percentage (.381), slugging percentage (.568) and on-base plus slugging percentage (.949). He placed fifth in voting for National League MVP for the second consecutive season. Tulowitzki picked up his first Silver Slugger Award for his offensive prowess. On the defensive side, he had the best fielding percentage (.984) and range factor (5.06) among all shortstops in the National League. He earned his second Fielding Bible Award and first Gold Glove at shortstop. He was also ESPN's 2010 Web Gem champion. On November 29, 2010, Tulowitzki agreed to sign a six-year extension on top of the three years, with a fourth option year, remaining on his contract. The six-year extension was worth around $120 million, making it the second-largest contract ever signed by a Rockies player (behind Todd Helton's nine-year $141.5 million contract). Tulowitzki's walk-up music to begin the season was Katy Perry's "Firework", which was chosen by fans in an online poll. However, he switched to Justin Bieber's "Baby" (another selection on the poll) after starting out in a 0–8 slump. Tulowitzki was elected by his fellow players as a National League reserve for the 2011 All-Star Game in Phoenix, Arizona, but after an injury to starter José Reyes (who was chosen by fans), Tulowitzki became the NL's starting shortstop. He had one hit during the game, which was a single. Tulowitzki won his second consecutive (third overall) Fielding Bible Award, as the best fielding shortstop in MLB. He also received his second consecutive Gold Glove and Silver Slugger Award. On April 1, 2012, during a spring training game against the Cleveland Indians, Tulowitzki was hit by a pitch on the arm by former teammate Ubaldo Jiménez. Both Tulowitzki and Jiménez came close to each other while the benches cleared. Jiménez received a five-game suspension and an undisclosed fine. As the season progressed, Tulowitzki required surgery on his left groin that would leave him unavailable for all of the 2012 campaign. The injury happened on May 30, during a doubleheader with the Houston Astros. It started to appear that Tulowitzki would be able to return before the season came to a close, but it would not be the case. The injury limited him to 47 games, in which he batted .287 with 8 home runs and 27 RBI. On June 13, 2013, Tulowitzki suffered a fractured right rib in a 5–4 loss to the Nationals. He was placed on the 15-day disabled list and missed 25 games. Despite the injury, Tulowitzki was selected for the 2013 Major League Baseball All-Star Game. Teammates Carlos González and Michael Cuddyer were also selected, and all three players were in the starting lineup for the National League. Tulowitzki hit .312 in 126 games in 2013, with 25 home runs and 82 RBI. Tulowitzki started 2014 by batting .364 in April with 7 home runs, 9 doubles, and 22 RBI. His hot start earned him the NL Player of the Month honors for April. On May 3, Tulowitzki singled for his 1,000th career hit in a game against the New York Mets. He injured his left hip during a July 20 game, and underwent labral repair surgery on August 15, which ended his season. Tulowitzki finished the campaign with a .340 batting average in 91 games played. Despite his injury shortened season, he hit 21 home runs and 58 RBI. Tulowitzki made his fifth All-Star team in 2015 as a replacement for the injured Dee Gordon. He batted .300 with 12 home runs and 53 RBI in 87 game with the Rockies before being traded. Tulowitzki about to hit a pitch during Spring Training 2016. Tulowitzki made his debut with the Blue Jays on July 29, and went 3–5 with a home run, 2 doubles, 3 RBI, and 3 runs scored. During a game against the New York Yankees on September 12, Tulowitzki collided with teammate Kevin Pillar while backpedaling to catch a fly ball in centerfield, and had to leave the game. He was expected to be out for a minimum of 2-3 weeks due to a cracked shoulder blade. Tulowitzki returned to the lineup shortly before the end of the season, and in total appeared in 41 games for the Blue Jays in 2015, batting .239 with 5 home runs and 17 RBI. He played in all 5 games of the 2015 American League Division Series, batting .095 with 1 home run and 4 RBI. In the third game of the 2015 American League Championship Series, Tulowitzki hit a three-run home run and was later ejected, and became the first American League player to be ejected from a postseason game since Dwight Gooden in 1998. The Blue Jays would win the game, 11–8. On May 13, 2016, Tulowitzki hit his 200th career home run in a win over the Texas Rangers. On May 28, he was placed on the 15-day disabled list due to a right quad strain. He was reactivated on June 18. Tulowitzki is of Polish descent, and was born in Santa Clara, California. Tulowitzki attended Fremont High School in Sunnyvale, California. He played Little League baseball with Sunnyvale National. Tulowitzki has a sister, Tiffany, who plays softball, and a brother, Tyler, who plays baseball for San Francisco State University. Tulowitzki's favorite players growing up were Nomar Garciaparra and Derek Jeter. His jersey number in college was No. 5, due to his admiration of Garciaparra. His jersey number with the Rockies and Blue Jays is No. 2, due to his admiration of Jeter. In a television interview with ESPN, Tulowitzki stated that his favorite team growing up was the Oakland Athletics and that his favorite musical artist is Jay-Z. ↑ MLBPLAYERS.com (October 3, 2007). "Troy Tulowitzki making his case". MLBPLAYERS.com. Retrieved July 9, 2009. ↑ Fraley, Gerry (October 19, 2007). "Tulowitzki rare mix of talent, leadership". Rocky Mountain News. Archived from the original on April 10, 2008. Retrieved July 9, 2009. 1 2 "Troy Tulowitzki: Biography and Career Highlights". MLB.com. Retrieved July 9, 2009. ↑ "TSN profile". The Sports Network. Retrieved July 9, 2009. ↑ "Team USA Wins Gold at World University Baseball Championship". Nebraska Huskers. Retrieved August 7, 2011. 1 2 3 4 5 6 7 8 9 10 "Troy Tulowitzki Statistics". Baseball-Reference.com. Retrieved July 9, 2009. ↑ DENVER (AP) (August 30, 2006). "New York Mets vs. Colorado Rockies – Recap". ESPN.com. Retrieved July 9, 2009. ↑ DENVER (AP) (August 31, 2006). "Francis a big hit at plate as Rockies avoid sweep by Mets". ESPN.com. Retrieved July 9, 2009. ↑ SAN DIEGO (AP) (September 4, 2006). "Barfield helps Padres maintain wild-card lead, beat Rockies". ESPN.com. Retrieved July 9, 2009. 1 2 "The Official Site of The Colorado Rockies: Team: Player Information : Biography and Career Highlights". Mlb.mlb.com. May 24, 2013. Retrieved August 4, 2013. ↑ "ESPN – Tulowitzki's game, passion belie his rookie status – MLB". Sports.espn.go.com. September 11, 2007. Retrieved August 4, 2013. ↑ "The Official Site of The Colorado Rockies: News: Colorado Rockies News". Mlb.mlb.com. Retrieved August 4, 2013. 1 2 "Tulowitzki Turning into Household Name". Longbeachstate.cstv.com. March 14, 2008. Retrieved August 4, 2013. ↑ "2012 Regular Season MLB Baseball 1B Fielding Statistics – Major League Baseball – ESPN". Sports.espn.go.com. Retrieved August 4, 2013. ↑ "Fielding Bible". Fielding Bible. Retrieved August 4, 2013. ↑ "Tulowitzki turns unassisted triple play". Mlb.mlb.com. Retrieved August 4, 2013. ↑ "ESPN – Braves vs. Rockies – Recap – April 29, 2007". Sports.espn.go.com. April 29, 2007. Retrieved August 4, 2013. ↑ "The Official Site of The Colorado Rockies: News: Colorado Rockies News". Colorado.rockies.mlb.com. May 24, 2013. Retrieved August 4, 2013. ↑ "Tulowitzki named Rookie of the Month". Mlb.mlb.com. May 24, 2013. Retrieved August 4, 2013. ↑ "The Official Site of The Colorado Rockies: News: Colorado Rockies News". Mlb.mlb.com. May 24, 2013. Retrieved August 4, 2013. ↑ "ESPN – Diamondbacks vs. Rockies – Recap – September 29, 2007". Sports.espn.go.com. September 29, 2007. Retrieved August 4, 2013. ↑ Phil RogersArchive (April 26, 2005). "ESPN – Coors Field a truly unique environment – MLB". Sports.espn.go.com. Retrieved August 4, 2013. 1 2 Ortiz, Jorge L. (October 22, 2007). "Colorado rookie Tulowitzki provides veteran presence". USA Today. Retrieved May 26, 2010. ↑ Baseball Prospectus Player Card for TROY TULOWITZKI Born 10-10-198 Archived July 6, 2007, at the Wayback Machine. ↑ Baseball Prospectus Player Card for RYAN BRAUN Born 11-17-198 Archived September 17, 2007, at the Wayback Machine. ↑ "The Official Site of Major League Baseball: News: Major League Baseball News". Mlb.mlb.com. May 24, 2013. Retrieved August 4, 2013. ↑ SportingNews.com – Your expert source for MLB Baseball stats, scores, standings, blogs and fantasy news from MLB Baseball columnists Archived October 16, 2007, at the Wayback Machine. ↑ Haudricourt, Tom (October 17, 2007). ""Record-Setting Bat Propels Braun," Baseball America, 10/17/07, accessed 10/18/07". Baseballamerica.com. Retrieved August 4, 2013. ↑ "Major League Baseball Players Recognize Top Rookie in Each League". All American Patriots. Retrieved August 4, 2013. ↑ "The 2007 Internet Baseball Awards; Results and Wrap-Up, Baseball Prospectus, 11/1/07, accessed 11/2/07". Baseballprospectus.com. November 1, 2007. Retrieved August 4, 2013. ↑ "The Official Site of Major League Baseball: News: 2007 This Year in Baseball Awards". Mlb.mlb.com. May 24, 2013. Retrieved August 4, 2013. ↑ ""Topps announces the 49th annual Topps Major League Rookie All-Star Team," KansasCity.Royals.mlb.com, 11/26/07, accessed 11/26/07". Kansascity.royals.mlb.com. Retrieved August 4, 2013. ↑ "ESPN – Padres vs. Rockies – Recap – October 1, 2007". Sports.espn.go.com. October 1, 2007. Retrieved August 4, 2013. ↑ "ESPN – Rockies vs. Phillies – Recap – October 4, 2007". Sports.espn.go.com. October 4, 2007. Retrieved August 4, 2013. ↑ "FOX Sports on MSN – Nine innings: Here's the dish on Cabrera". Msn.foxsports.com. Archived from the original on November 30, 2007. Retrieved August 4, 2013. ↑ "Brewers sign Braun to eight-year deal". Mlb.mlb.com. Retrieved August 4, 2013. ↑ "Tulowitzki out at least until All-Star break". Colorado.rockies.mlb.com. May 24, 2013. Retrieved August 4, 2013. ↑ Giannandrea, Nick (June 11, 2008). "Tulowitzki: 'No pain' in first rehab game : Rockies". The Rocky Mountain News. Retrieved August 4, 2013. ↑ "ESPN – Mets vs. Rockies – Recap – June 20, 2008". Sports.espn.go.com. June 20, 2008. Retrieved August 4, 2013. ↑ "ESPN – Tulowitzki placed on 15-day DL after cutting hand smashing bat – MLB". Sports.espn.go.com. July 5, 2008. Retrieved August 4, 2013. ↑ "ESPN – Dodgers vs. Rockies – Recap – July 21, 2008". Sports.espn.go.com. July 21, 2008. Retrieved August 4, 2013. ↑ "ESPN – Tulowitzki has career-high five hits in Rockies' return – MLB". Sports.espn.go.com. July 22, 2008. Retrieved August 4, 2013. ↑ Mid 5th. "ESPN – Troy Tulowitzki Stats, News, Photos – Colorado Rockies". Sports.espn.go.com. Retrieved August 4, 2013. ↑ "Chicago Cubs vs. Colorado Rockies – Recap – August 10, 2009 – ESPN". Sports.espn.go.com. August 10, 2009. Retrieved August 4, 2013. ↑ Spector, Jesse (August 10, 2009). "Oh Boy, Troy!". Daily News. New York. Archived from the original on August 13, 2009. 1 2 "Third time is charming for MVP Pujols | MLB.com: News". Mlb.mlb.com. Retrieved August 4, 2013. ↑ "Broken left wrist lands Tulowitzki on DL | ColoradoRockies.com: News". Colorado.rockies.mlb.com. Retrieved August 4, 2013. ↑ "Jimenez, Tulowitzki named first-time All-Stars | ColoradoRockies.com: News". Colorado.rockies.mlb.com. May 24, 2013. Retrieved August 4, 2013. ↑ "Rockies' Troy Tulowitzki named NL player of the week -- again". On the Rox. Retrieved July 29, 2015. ↑ "Tulowitzki, Lowe voted National League Player, Pitcher of the Month | MLB.com: Official Info". Mlb.mlb.com. May 24, 2013. Retrieved August 4, 2013. 1 2 "CarGo, Tulo team up again, win Silver Sluggers | MLB.com: News". Mlb.mlb.com. May 24, 2013. Retrieved August 4, 2013. ↑ "Votto wins NL MVP by overwhelming margin | MLB.com: News". Mlb.mlb.com. Retrieved August 4, 2013. ↑ Archived June 7, 2010, at the Wayback Machine. ↑ "Scott Rolen wins Gold Glove in third different uniform – ESPN". Sports.espn.go.com. November 11, 2010. Retrieved August 4, 2013. ↑ Fisher, John. "Gold Glove for Pujols, CarGo but not Utley – Stats & Info Blog – ESPN". Espn.go.com. Retrieved August 4, 2013. ↑ "Rockies hand All-Star Tulowitzki six-year, $120 million extension". CNN. November 29, 2010. ↑ "The 2011 Awards". The Fielding Bible. Archived from the original on November 1, 2011. ↑ "MLB's top offensive players earn Silver Slugger Awards | MLB.com: News". Mlb.mlb.com. May 24, 2013. Retrieved August 4, 2013. ↑ "Nine first-time winners highlight Gold Gloves | MLB.com: News". Mlb.mlb.com. May 24, 2013. Retrieved August 4, 2013. ↑ Silva, Drew (August 13, 2014). "Troy Tulowitzki to undergo season-ending hip surgery". NBC Sports. ↑ "Troy Tulowitzki replaces Dee Gordon on the NL All-Star team - HardballTalk". nbcsports.com. Retrieved July 29, 2015. ↑ Nightengale, Bob (February 29, 2016). "Troy Tulowitzki still seething over Rockie exit from Denver". usatoday.com. Retrieved June 14, 2016. ↑ Gregorson, Derrick (July 28, 2015). "Troy Tulowitzki says he was "shocked" by trade to Blue Jays". ESPN.com. Retrieved July 28, 2015. ↑ Rutsey, Mike (July 29, 2015). "Blue Jays' Tulowitzki special in debut, a romp over Phillies". Toronto Sun. Retrieved July 29, 2015. ↑ Coutu, Melissa (October 19, 2015). "Blue Jays' Troy Tulowitzki ejected from Game 3 of ALCS". globalnews.ca. Retrieved October 20, 2015. ↑ Chisholm, Gregor; Flanagan, Jeffrey (October 20, 2015). "Blue Jays outslug KC to trim ALCS deficit". MLB.com. Retrieved October 20, 2015. ↑ Sullivan, T.R. ; Chisholm, Gregor (May 13, 2016). "Blue Jays handle Texas with R.A. dealing". MLB.com. Retrieved May 14, 2016. ↑ Zwelling, Arden (May 28, 2016). "Blue Jays place Tulowitzki on 15-day DL, activate Loup". Sportsnet. Retrieved May 29, 2016. ↑ Dakers, Tom (June 18, 2016). "Troy Tulowitzki activated, Andy Burns sent down". Bluebird Banter. Retrieved June 18, 2016. ↑ Brown, David. "Answer Man: Troy Tulowitzki talks brackets, Dirtbags and mullets – Big League Stew – MLB Blog – Yahoo! Sports". Sports.yahoo.com. Retrieved August 4, 2013. ↑ "Troy Tulowitzki Stats, Fantasy & News". MLB.com. Retrieved October 20, 2015. ↑ "San Francisco State University Athletics – 2012 Baseball Roster". Sfstategators.com. Retrieved August 4, 2013. ↑ Renck, Troy E. (April 2, 2007). "Shortstop on way to stardom". Denver Post. ↑ Renck, Troy E. (February 3, 2010). "Rockies' star Tulowitzki armed with better sense of priorities". Denver Post. ↑ "Kiszla: Troy Tulowitzki, face of the Rockies, now a father too". denverpost.com. Retrieved July 29, 2015. Wikimedia Commons has media related to Troy Tulowitzki.